In its earliest days, the internet used to deal in intangibles. We could distribute or read articles, receive emails or correspond on forums. Today, the internet deals in assets – items that we want to protect and can touch. These assets are encoded and then stored on peer sharing network chain called a ledger or Blockchain. Inside a Blockchain, each member can see who we are doing business with. This prevents theft and protects the business dealings. Furthermore, it also saves us from hiring a third party, simplifying our affairs, reducing errors and hastening the process. With the passage of time, Blockchain technology is going to radically change our lives. It will affect the way we prove who we are, the way we transact business, rent a car, manage our assets, vote or use other machines. In due course, it will transform the functioning of Governments, financial institutions, companies, hospitals etc. 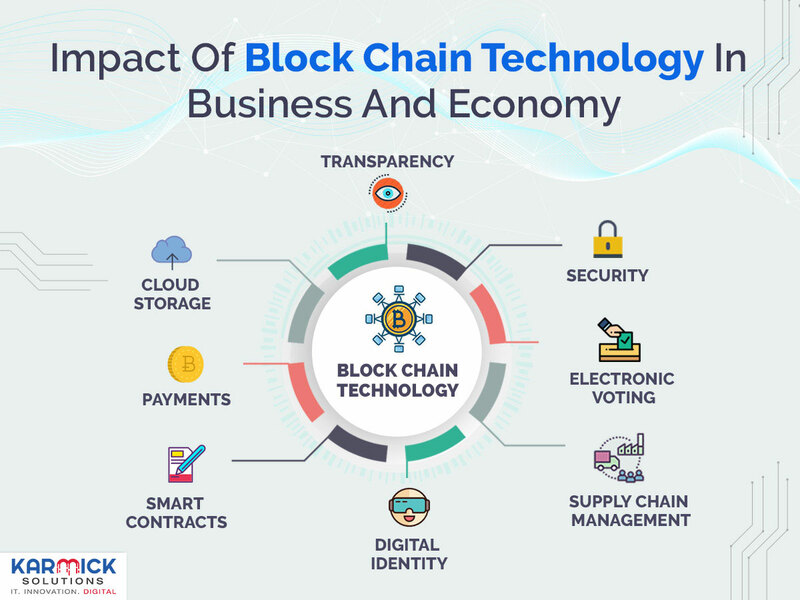 Below are discussed some ways in which Blockchain technology is going to change business and economy around us. In the coming few years, Blockchain data storage will revolutionize business and technology. Presently, cloud storage services are centralized. As a result, you have to place your trust in a single service provider who controls all our assets. Blockchain technology decentralizes the entire process. It decreases dependency and increases security. Furthermore, users can rent out any excess storage capacity that they may have to similar to the Airbnb business model. With the help of the blockchain network, we can store our data with anybody on the internet in return for a price. This keeps the information safe and secure. Once the data is sent out to the network, it is easy to keep track of with the help of the basic metadata. Today, a significant portion of the world’s population does not have access to financial services. They cannot get loans to get houses or start loans, make investments or use banks. There is a unique opportunity for Bitcoin to provide people living in third world countries with money that they can transact internationally without paying any fees. It is worthwhile to note that some of the biggest financial institutions in the world such as Goldman Sachs etc. are already exploring Blockchain technology and are a very generous investor in companies dealing with the same. Similarly, Visa is partnering with companies that help financial institutions to process payments globally in an easy and quick way. The term smart contract has become colloquial thanks to the Ethereum project which was released in 2013. It was first used in 1993. Smart contracts run without any allowance for any form of third party interference, downtime, fraud or censorship. Smart contracts may also be defined as self-automated computer programs that can fulfill the terms of any contract. It is a financial security that is held by a network in escrow. It is routed to recipients based on computer code and future events. Businesses will be able to lower their costs for the most basic financial transactions and sidestep regulations. Most importantly, these contracts are unbreakable. Digital identity security is a major issue in today’s world. By some estimates, digital identity theft costs almost as much as $20 billion annually. That amounts to roughly $1 in theft out of every $3 in annual spending. Blockchain technologies make managing digital identities and tracking both efficient and secure. This results in reduced fraud and smooth sign on. Be it online retailing, banking, citizenship documentation, health care or national security, identity authorization has become an integral part of our everyday lives. Breached accounts and hacked databases are a stark reality of a technologically advanced society like ours. Blockchain technology offers a solution to this unique problem. With the help of Blockchain, identity can be verified in a secure, irrefutable and immutable fashion. Presently, we use password-based shared secrets stored and exchanged on imperfect systems. The Blockchain authentication system is based on digital signatures which in turn are based upon public key cryptography. Identities are verified on the basis of the correct private key. It is automatically assumed that the individual who possesses the correct private key will be the rightful owner and the identity of the owner itself is rendered irrelevant. We live in a global economy. This means that international supply chains affect the various attributes of our everyday products such as price, quality, availability etc. Having said that, tracing the journey or which step of the supply chain the product is in is a complicated process. However, with the help of Blockchain technology, we could execute a public ledger that documents every transaction. This reduces human intervention to the minimum and increases the efficiency of the overall process. Furthermore, the public verification step adds a new layer of accountability that can be better monitored and tracked by regulators. Also, this could substantially bring down the overall costs of industry regulation altogether. Delegated Proof of Stake or DPOS is often considered the most flexible, fastest, most decentralized and efficient consensus model available. It allows the stakeholder approval voting and consensus issues to be resolved in a democratic and fair way. Network parameters such as transaction sizes, fee schedules, block intervals etc. can be resolved with the help of DPOS. Within this system, transactions can be confirmed in a matter of seconds. Most importantly, all the participants within the network are protected from unnecessary interference of regulatory bodies.